Natural hair colour pigment lift and tone. As stylist’s. Hair colour technicians. Salon owners and indeed trainee’s we owe it to ourselves our team and mates and clients to be educated in the field of hair colouring being current in both product knowledge and techniques.With this in mind and as a follow on from a recent posting on the N series a more technical look at the issue. Natural hair colour and trying to recreate it can be a challenge for some. Why is this? It’s that balance between pigment lift and tone. Chosen colour formulation and timing. As a stylist do you understand the ‘Law of Color’? As they relate to hair colouring?Yes Laws ! Oh your one of those hands on stylist who are fortunate enough to know everything. One who does not need to know or understand the law’s of colour. Your a free spirited creative artist! Your just someone with a huge Ego who muddles along getting bye with hit and miss colouring mishaps! A stylist who when things go wrong blames the product! How and why understanding and indeed trusting the colour wheel is so important to succeed. Hair color is an art and a science. The natural laws as they relate to hair colour apply to everybody everywhere. They work off of a Natural scale of hair depth and tone one to ten. The higher the number lighter the shade or level. Laws are simple they are beyond one’s control they never require a second guess or questioning. Never the less we still insist on the odd experiment to verify them. When you come to accept the law of colour cannot be broken then you learn to trust it, you always know the outcome. The laws of hair color are important and often very neglected. It’s imperative that all professional hair stylists know why we do what we do. Why do you choose the color you do to use on your client? When you as a stylist take the time to learn the universal laws of hair color. You will be better equipped to work with and advise your client on the best course of action and an ideal formulation for them. Color is light and pigment. When we color someone’s hair with the right choice of colour, we can emphasize their skin tone and eye color. When we understand these laws and trust them we can grow and improve. understanding is one thing trust is much more! We will never have to guess the outcome of our results will always feel in control confident and professional. There are three primary colors: Blue, Red, Yellow. They are called primary because all other colors are made from them. Tertiary colors are made by mixing the primary and secondary colors together. There are six possible combination’s. They are yellow-orange, red-orange, red-violet, blue-violet, blue-green, and yellow-green. You will produce a neutral or browned-out color. sometimes Mud is created. 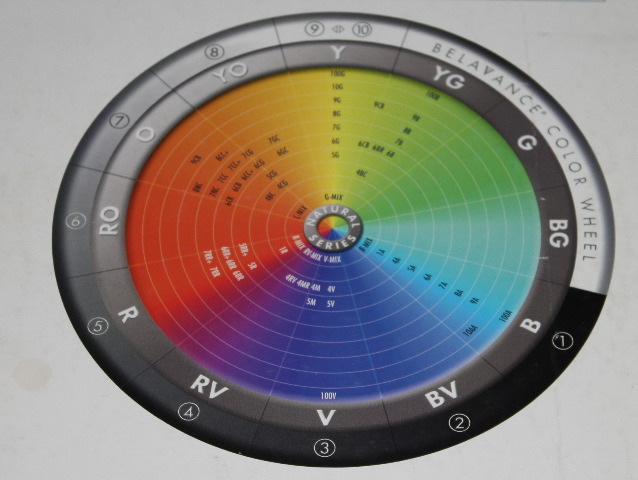 A colorist should not only always consult and understand the color wheel. It is a tool that will be used almost every time you color a client’s hair. It will help you create colors with a better understanding of utilising and neutralising pigment and tone. contrasting colors are placed directly across from their opposite. 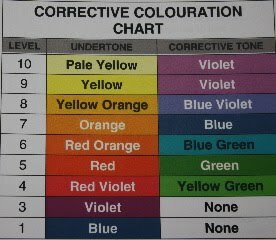 This is very important since it is necessary to know which colors can be used to “neutralise” or “brown-out” undesired tones. A good example of this and indeed a common issue for stylists is neutralising unwanted orange and yellow tones in the hair. When you know and understand the color wheel and can see that violet is the opposite of yellow on the color wheel, you can then choose a violet pigment in order to neutralize the yellow. Violet being a even mix of red and blue. these will restore balance to unwanted yellow creating a natural tone. If the unwanted color is orange, you can see that blue is the color to use to neutralize the unwanted tone. Orange being made up or Yellow and Red so blue is required to restore balance.See it;s easy common sense and understanding. 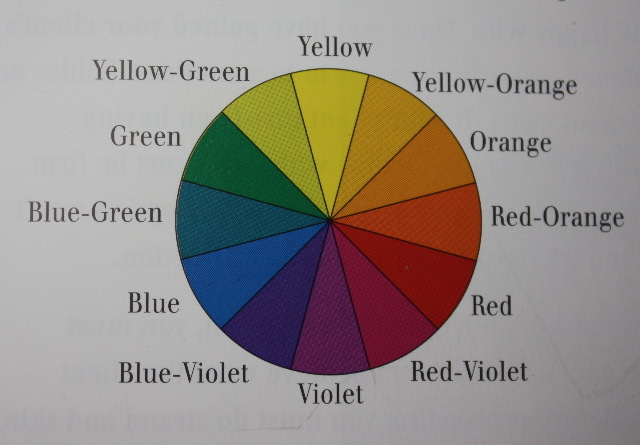 The color wheel is also separated into warm and cool colors. Blue (one of our three primary colors) is the coolest cool color and is also the darkest. It generally lives at a level three, masking out both gold and warm red tones or Hue! The more blue that is added to your hair color the more it will produce a darker, cooler tone. Red or yellow (our other primary colours) are warm colors. Adding red to your hair color formula will create a warmer tone. Just as blue is the darkest cool toned color, yellow is the lightest warm toned color. Adding yellow to your color formula will always produce a lighter, brighter color. depending on the level you are working at Yellow normally comes out to play between the natural level 7 to 10 any level darker than this the yellow will be over powered by either the Red or Blue Pigment. This is such a huge topic that one can expand on when introducing the effects of lift from chosen formulation and level strength of hydrogen peroxide or developer. These lifting agents will expose pigment as they lift the hair in the colour process adding warmth from the hair to your formulation. Again understanding the colour wheel really is key to hair colouring success for both you as a stylist and for your client who will see the skill and technical knowledge required to colour hair and address issues correctlyThe salon salon and the S word, Alterego Italy, Stylist mentoring, hair stylist, creativity,skills, service. The look, the challenge, the journey, all working together to make it happen and share in the success. Having a vision a goal is what motivates and drives us sharing a vision with others helps it become a reality. Have the right team wanting and willing to share your vision respecting your commitment trusting you to share thoughts views opinions trust a willingness to listen and collaborate.